‘Love Albert Road Day’ was a very successful one day cultural festival, held in Albert Road, a very vibrant street in Southsea. Organised by a group of traders, to showcase what this colourful street had to offer and was very much a multicultural experience. Throughout the day, the public enjoyed a diverse variety of live music, dance, art, food and drink. The event was held between 2007 to 2009 and was hugely popular and is much missed and talked about today. 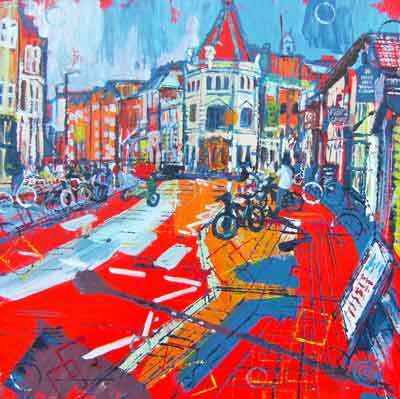 Through showing work in Albert Road, Simon Whitcomb became involved in events there. Simon regularly sketched and painted the street scenes outside the gallery where he showed his work. 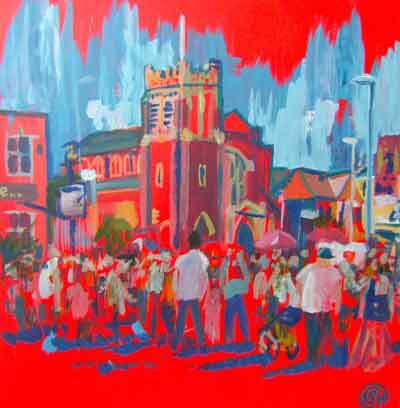 During the 2008 'Love Albert Road Day', Simon painted four canvases to capture the carnival atmosphere. "Moving through thousands of people, setting up my easel to paint was a wonderfully exciting and challenging experience" says Simon. "Returning the following year in 2009, I tried another approach at capturing the event". Simon goes on to say "This time I worked on the rooftop at Parmiter Antiques, one of the organisers of the event". "I painted a panoramic view from above capturing the exciting scenes below, providing an interesting and unique perspective".The four canvases tell the rest of the story. Simon went on to become resident artist at The Kings Theatre, working on installations in the theatre and running regular workshops in his now successful Art School, during Easter and Summer holidays for children between 8-12 years of age. 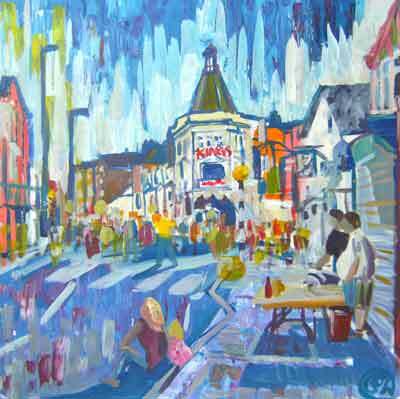 Simon has also painted and sketched scenes at other events, such as the 'Southsea Show', 'Funky Town Fest' and 'Picnic on the Green'.